Christina Aguilera has sported her fair share of over-the-top looks during her time as a coach on The Voice, and has often made headlines for her cleavage-flaunting fashions. Now it looks as though the pop star has cleaned up her act and adopted a more conservative look for her return to Season 5 of the hit NBC program. In new publicity photos for the show, the "Genie In A Bottle" singer looks like she could be heading to her downtown office, wearing a black and white skirt and a black blouse that's a bit less revealing than her usual over-the-top fashions. She's looking fit and trim, and her blond locks are straightened and cut in a sophisticated chin-length bob. 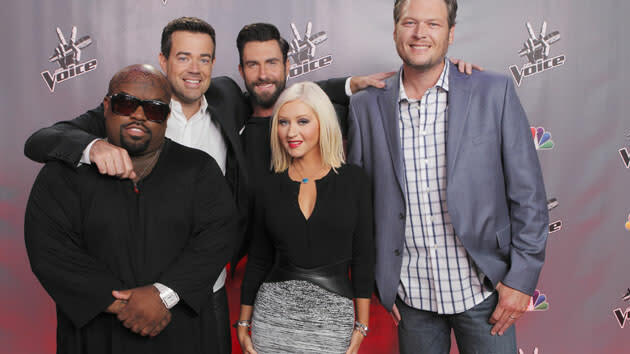 Original coach Cee Lo Green is also back in the saddle, joining Blake Shelton and Adam Levine for the new season, which kicks off September 23 on NBC. It'll be great to see the gang back together again, looking better than ever!